Jakub P., Greg B., Lesley P., Dave C.
Hello listeners! We’ve got a special treat for you today. 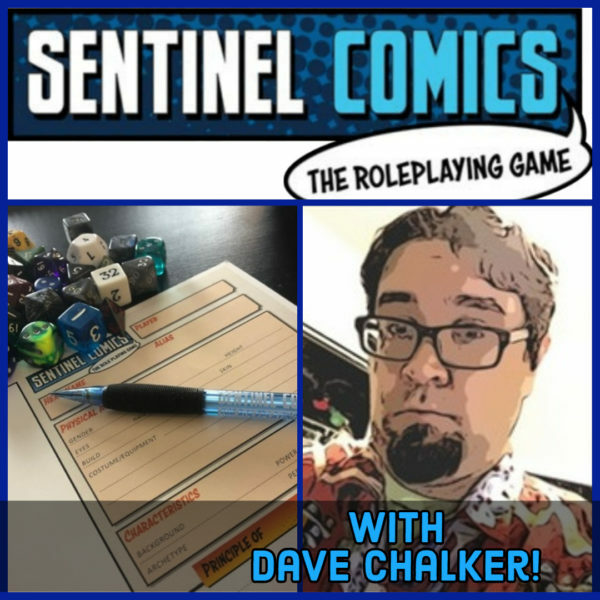 Game designer and friend of the podcast Dave Chalker is back to talk about the upcoming Sentinel Comics RPG! In particular, he walks us through the extremely robust character reation process. Using nothing but the system, we create three characters from the ground up. Backstories, powers, even our motiations and personalities. It’s really unique and we hope you enjoy this sneak preview! If you’re interested in the Sentinel Comics RPG, you can check out their Kickstarter until February 22. There’s also a Gameplay Guide that will give you a taste of the system using some of the most beloved Sentinels characters. While you’re at it, head over to our Instagram to let us know your favorite superpower! Lesley and Dave also share what they’ve been playing lately. Between the two of them it’s a respectable list: Spirit Island, Bruges, Terraforming Mars, Between Two Castles, and Aeon’s End: Legacy. Thank you as always to O Abnormal and Agata Poniatowski for the artwork and Strangelette for the music. If you enjoyed this episode and would like to support Dragon’s Demize, please consider joining us on Patreon. You can also follow us on Facebook, Twitter, and Discord. Finally, all of our streams, vlogs, and other video content on live on our Youtube channel, or you can catch us live every Wednesday on Twitch.